This morning, the Düsseldorf Higher Regional Court (an appeals court) announced that it has upheld a preliminary injunction against the Samsung Galaxy Tab 10.1 and has confirmed that the smaller Galaxy Tab 8.9 falls within the scope of that injunction. But this doesn't mean that Samsung lost all the way: the appeals court based its decision on a violation of German unfair competition law (Gesetz gegen den unlauteren Wettbewerb, UWG), while the lower court's ruling was based on a finding of a violation of a Community design, the European equivalent of a U.S. design patent. The preliminary injunction was originally ordered in early August 2011 and, following a hearing by the same court, upheld in early September 2011. Subsequently, Samsung appealed the case to the Düsseldorf Higher Regional Court. Apple can't replicate the German decision in other countries since German unfair competition law is pretty unique. A win based on an EU-wide design right would have been strategically more valuable to Apple. Even though Samsung formally lost its appeal because the preliminary injunction remains in force, it succeeded in defeating Apple's design right. A couple of months ago, Samsung launched a modified version of the Galaxy Tab 10.1, named 10.1N, in Germany. In late November 2011, Apple requested a preliminary injunction against the 10.1N. For now, the 10.1N is still on sale. The Düsseldorf Regional Court held a hearing the week before Christmas and will announce a decision on February 9, 2012. The fact that Apple won today doesn't necessarily mean that it will succeed against the 10.1N. If Samsung is allowed to continue to sell the 10.1N, the commercial relevance of today's appellate decision is next to nil. While today's decision was made by an appeals court, we are still talking about fast-track proceedings triggered by a request for a preliminary injunction (and an appeal against one). All those decisions are preliminary, and what matters most is the full-blown main proceeding in which Apple's design-related claims against a total of 15 Samsung products are at issue. It's too early to tell what the outcome of that case will be. In my opinion, the strategic value of those design-related lawsuits is relatively low. Preliminary injunctions based on such claims can have a temporary disruptive effect, but the world-spanning dispute between Apple and Samsung primarily hinges on the outcome of the parties' technical patent infringement claims against each other. The first two patent infringement lawsuits Samsung brought against Apple in Germany have been dismissed. Decisions on Apple's related claims will come down in the coming months. One week after dismissing Samsung's first German patent infringement lawsuit against Apple, the Mannheim Regional Court also rejected Samsung's second complaint. Either complaint related to the 3G/UMTS wireless telecommunications standard. I attended the pronouncement of the ruling (at 9 AM local time). Judge Andreas Voss did not state any particular reasons for the decision. As I explained in the post linked to above, different reasons are conceivable. The outcome of Samsung's first two German actions against Apple may be based on reasons specific to the validity and/or infringement of those patents, in which case Samsung could still prevail over any or all of three other 3G/UMTS patents it is asserting against Apple in Mannheim. Samsung is furthermore suing Apple over two non-standards-related patents, including a patent on a method to enter smileys on a mobile device. At the mid-November hearings. it looked like Samsung was reasonably likely to prevail on at least one of the two patents. The case that was adjudicated today looked more promising to Samsung than the one dismissed last week. For Samsung, this outcome must be disappointing. But the Korean electronics giant is known for its fighting spirit and unlikely to back down. It remains to be seen whether Samsung will appeal any of these rulings to the Karlsruhe Higher Regional Court. Presumably, Samsung will have to analyze the reasoning behind this decision in order to decide on a possible appeal. Apple's and Samsung's claims against each other continue to have a very high drop-out rate in different jurisdictions. Since both companies are doing very well (with Apple being not just highly but even unbelievably profitable), they can afford to keep going, and at this point neither litigant has the leverage to force its rival into a settlement. 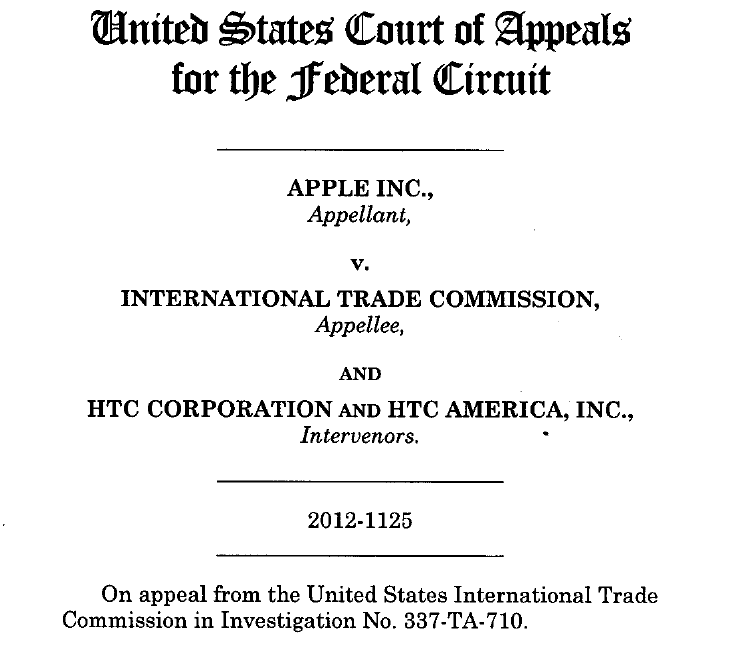 On December 19, 2011, the ITC handed down its lenient final ruling on Apple's first complaint against HTC, holding the Taiwanese company's Android devices to infringe only one of Apple's asserted patents and providing for generous transitional periods during which HTC can still ship infringing devices. Apple wouldn't be Apple if it contented itself with an outcome that represents significant progress but is clearly suboptimal, especially since it falls short of the initial determination made by an Administrative Law Judge. In fact, Apple lodged this appeal back on December 29, 2011, but it's not always easy to find out about CAFC proceedings. I just ran a few searches on Google News and couldn't find any previous report on this appeal. Today I became aware of it because Apple mentioned this appeal yesterday in a filing with the United States District Court for the Northern District of Illinois. In that court, Apple is asserting the '263 "realtime API" patent (for more information on its significance, let me refer you to the infringement claim chart and a blog post on Apple's claim that Android chief Andy Rubin got the inspiration for Android while working at Apple, where his then-bosses made this particular invention) against Motorola. 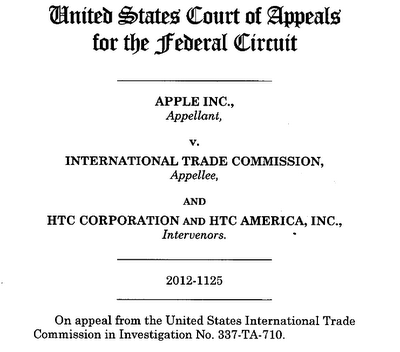 Apple told the Chicago-based court that an Administrative Law Judge agreed with Apple's construction of the term "realtime application programming interface" (and, as a result, held HTC to infringe it) but the Commission, the six-member decision-making body at the top of the ITC, "reversed the ALJ's construction". Motorola argued that the Commission decision should be taken into account by the district court, but Apple states that "[t]he Commission's decision is on appeal to the Federal Circuit and has no preclusive effect in this [District] Court". Therefore, it's clear that Apple's appeal of the ITC ruling at least aims to broaden the scope of the import ban by including the '263 patent. If Apple succeeded, this would greatly increase the business impact of the import ban. U.S. Patent No. 5,481,721 on a "method for providing automatic and dynamic translation of object oriented programming language-based message passing into operation system message passing using proxy objects"
U.S. Patent No. 6,275,983 on an "object-oriented operating system"
The Commission looked into issues concerning those two patents, but deemed the '721 patent invalid and not infringed, and concluded that the '983 patent was neither infringed nor practiced by Apple according to the ITC's claim construction (and under Apple's own claim construction, the Commission said the patent would still not be infringed, but it would be invalid). Apple may hope that the CAFC will let it prevail on one or both of those patents as well. Every import ban proposed by the ITC is subject to a Presidential Review, which takes 60 days, but the ITC gave HTC two extra months to modify its products so as to steer clear of infringement. This means that the formal ban only takes effect in April 2012, more than two years after Apple's original complaint. As I noted, the fact that HTC immediately announced a workaround (which simply came down to removing the feature) and downplayed the importance of the related feature suggests that the ITC ruling was exceedingly lenient. Apple may be appealing that question as well. Even though this appeal won't be resolved in time to shorten that transitional period, Apple might have a strategic interest in this issue with a view to its other ITC complaints that are still being investigated or that it may bring in the future. The ITC furthermore decided not to issue a cease-and-desist order. The purpose of a cease-and-desist is to stop companies from selling infringing devices that they imported before the ban took effect. Without a cease-and-desist, companies can import huge quantities of products shortly before the import ban and thereby delay the business impact of an ITC ruling. This, again, will be too late for HTC's devices, but could be a strategic issue with a view to Apple's continuing enforcement of intellectual property rights. Whatever the scope of Apple's appeal against the ITC may be, I believe Apple has realistic chances of winning a better outcome, but this will take time before the CAFC hands down its decision on this appeal. Some of the other recent and upcoming smartphone-related ITC decisions may also be appealed. The drop-out rate of patents asserted in ITC complaints is astoundingly high, and I wouldn't be surprised if the Federal Circuit found that the ITC erred in favor of respondents in a few cases. Apple is no stranger to the Federal Circuit. Also in December, Apple filed an appeal against the denial of a preliminary injunction against Samsung by the United States District Court for the Northern District of California. Appeals against decisions on preliminary injunction motions are usually adjudicated more swiftly than those against ITC rulings. My guess is that Oracle will accept this offer because other than costs, which are going to be sizable in absolute numbers but small compared to what's at stake, there's no colorable drawback that Judge Alsup's proposal has over Oracle's own proposals. Today Oracle has indeed accepted the deal. By doing so, Oracle has once again demonstrated that damages are not its number one priority. Otherwise Oracle would have had to keep fighting for its previous damages claims. Instead, Oracle puts its money where its mouth is and agrees to pick up the costs arising from the presentation of a third damages report. I explained the "deal terms" in the aforementioned blog post, so I don't have to go into detail again here. Oracle had urged the court to take this case to trial at the earliest opportunity. It stressed Android's commercial success and the threat it poses to Java. Oracle even offered to put its patent infringement claims on the back burner in exchange for a near-term copyright trial. The judge rejected that proposal but the deal he offered, and which Oracle accepted, is a win for Oracle. It's clearly Oracle's best shot at a swift resolution of this matter, and it doesn't even have to indefinitely postpone the resolution of its patent infringement claims. Theoretically, Oracle's third damages report could still arrive at a similar number as the second one ($2.7 billion, slightly up from the original $2.6 billion claim). The most important difference between the third damages report and the previous ones will be a fine-grained apportionment of damages to the different intellectual property rights (even down to the level of different claims of the same patent) at issue. But even if Oracle's third damages report arrived at a lower amount, any such reduction would be much less important than the prospect of a near-term trial. Also, the relevance of the parties' own damages calculations is rather limited if the jury mostly relies on the opinion of a court-appointed independent expert. For now I wouldn't book a flight to San Francisco in mid-April for this trial. There is still a considerable risk of further delay. In particular, Google might try to slow-roll the process since the judge indicated that the trial would have to be postponed to the last four months of the year if mid-April doesn't work out. But Oracle has demonstrated its willingness to do its part. One doesn't have to agree with Oracle on all of the issues (I agree with them on some and disagree on others) to recognize that its words and its actions are consistent. Today's decision is available on the Internet (in Dutch). As I'll explain below, the rationale underlying this decision is very similar to the approach taken by Judge Lucy Koh of the United States District Court for the Northern District of California, who denied Apple a preliminary injunction for (among other things) an iPad-related design patent that is the U.S. equivalent of the Community design asserted in Europe. Apple is appealing Judge Koh's decision. The Dutch appeals ruling comes down one week before a ruling by the Düsseldorf Higher Regional Court, a German appeals court that might lift a preliminary injunction granted to Apple by a lower court in the same city in early August 2011. Furthermore, the Düsseldorf Regional Court will rule in early February on an Apple motion for a preliminary injunction against the Galaxy Tab 10.1N, a product version with a modified, potentially non-infringing design. Last week, Apple filed two new design lawsuits targeting a total of 15 Samsung products in Germany. As I explained then, the two companies need the courts in various jurisdictions to clarify where Apple's exclusive scope of protection ends and Samsung's freedom to compete begins. There's no mathematical formula based on which they could simply agree that Samsung's products are allowed to have a degree of similarity of up to (for example) 70%. Instead, they need guidance from judges. Apple's asserted design-related right, Community design 000181607-0001, was not held invalid since none of the prior art presented by Samsung features all of the key characteristics of Apple's design. However, the existence of at least two pieces of prior art for each of the asserted key design elements led the Dutch appeals court to determine that the valid scope of Apple's asserted design-related right is narrow. Based on that narrowed scope, the asserted right was not deemed infringed. By contrast, the Düsseldorf Regional Court had described, at a hearing and in its detailed written decision, the scope of protection as "medium-range or broad". The Dutch decision had to address the finding of the Düsseldorf court due to EU rules. Courts in one EU member state can reach different conclusions than those in another on the same matter of EU law, but they must at least explain why they beg to differ. Here, the Dutch appeals court says that it took into account some additional prior art that was not considered by the Düsseldorf court. In my opinion, the Düsseldorf Regional Court had actually failed entirely to narrow the scope of the asserted design right based on existing prior art. In the United States, Judge Koh also narrowed the scope of Apple's design rights based on prior art. Like her Dutch colleagues, she also concluded that the asserted design right was not necessarily invalid but narrowed its scope in light of prior art. In the Dutch appeals proceeding, Apple also sought a preliminary injunction against the Galaxy Tab 10.1V, an older and thicker version of the tablet. It appears that the 10.1V is no longer marketed. The Dutch appeals court didn't find that Apple satisfied the sense-of-urgency requirement, without which there is no basis for a preliminary injunction. The Dutch ruling notes that only two of those pieces of prior art were considered by the Düsseldorf Regional Court (the HP Compaq TC1000 and the Knight Ridder tablet). Next week we will know whether the Düsseldorf Higher Regional Court takes any additional pieces of prior art into consideration.